Like this video? Click here to Subscribe for free on YouTube! Hey, Melanie Beckler here with your angel card reading for the September 1st, 2016 new moon solar eclipse. We’re going to use the Ask Angels Oracle Cards to tune in to the energy on and around this new moon, including what we’re moving into and the guidance the angels can share with us about how to make the most of this incredibly energetic month. There’s a few things going on this month. We have multiple eclipses, the September Equinox, Mercury retrograde, and in addition September is a 9th month which means it’s an opportunity to get to work on your light work, to step more fully into your authentic soul truth. This is going to be an energetically powerful month creating opportunities for immense healing and big shifts. In addition to that, let’s check in with the angels using the Ask Angels Oracle Cards which yes, you guys, are finally actually coming soon in print, so more on that soon. For now, let’s dive into the angel card reading. As always with card readings, I love to start by just shuffling the cards, and shuffling light into the cards as I invite the angels in to surround us with love and divine light and healing frequency. Now, I just want to point out that when I do this angel card reading, I’m going to share with you my intuitive impressions as to the card meaning. But pay attention to your own internal messages, because when you focus inward, focusing on your heart, present in your body while listening to this message you can connect with angelic guidance directly. Notice what you tune into between the words I share and in between what I'm saying, because you have angels and your angels are guiding you directly. So as I do this card reading, it’s highly likely that you're going to receive some specific pertinent guidance directly from your angels, that’s highly relevant to your life as an individual in stepping into your light work this month and moving forward. Now, with the angels and divine light all around us, I’m going to go ahead and shuffle the cards a bit more and I want to do a two card reading. I love doing two card readings and I don't see many people doing them, so I'm going to explain to you how to do the two card reading in addition to doing this now. The first card that I drew for September represents the main energy of the month that’s going to support you in stepping into your light work. And this card is with Archangel Haniel, and its inner child healing. The intuitive impression I'm getting from the angels about this card is that it's more important now than ever before to step into your full light, the full light of your authentic self that’s always present in every moment, beneath whatever illusions or challenges of the external world are happening, beneath whatever ego thoughts and doubts and fears you’re experiencing is the full authentic light of your soul. Now, a large part of what still challenges people in the present that blocks maybe you from stepping into your full soul light work are the thought patterns and beliefs learned in childhood. The voice of that person from your past who either made fun of you, or said you couldn’t… the part of you that spoke to your inner child and told you no, and told you be safe, maybe even be afraid, be careful, and to not fly too high. 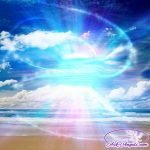 The angels are bringing you the message now, that you are safe to step into your full soul light. You are safe to take steps in the direction of doing your authentic light work that only you can do, making a difference in the world through your action and through your simple presence. And so, there’s extra healing this month for your inner child, for the part of you that's afraid, for the part of you that’s scared to put yourself out there, that's scared to walk your talk, and to be fully and authentically you. The angels say, “Love the part of you that's afraid. Love the part of you that doubts. Love your inner child.” And in that, there's so much opportunity for you this month to shine more brightly than you ever have. Okay, I'm getting the nudge to look at our next card. The second card in the two card reading provides clarification, provides a counter perspective, or provides a sort of validation. It’s essentially just going deeper in this theme of healing your inner child so you can step into your full soul light. And so, our second card is with your guardian angels and it’s saying, “Ask for help”. Really, this is the perfect complement to inner child healing. Your inner child is ready to be healed, to get on board with being bold and confident in standing in your full light and doing your light work. The appearance of this card brings the reminder that you always have so many angels who are around you, who are ready and willing and able to support you in your life, but you have to ask for their help. When you do ask for angels to help you, they’re able to make real improvements and even drastic changes, to help improve your situation, to lineup opportunities, chance meetings, and to help you let go of fear, heal from the past, and embrace all that you are in the present. I mentioned before we even started the reading that there's a Mercury retrograde happening this month, along with multiple solar eclipses. So many people have traditionally both feared Mercury retrograde, and eclipses. The angels are saying, “Don't be afraid, but remember to ask for help.” If you have travel coming up, which is one of the areas that Mercury retrograde historically has caused challenges or delays or setbacks, ask your angels to help you through your travels. If you find you’re challenged with technology or experiencing health challenges, ask your angels for healing, for guidance, and for support to help you through. Ask your angels for help in seeing the underlying oneness with everyone and everything. That’s a big theme this month, witnessing your oneness and interconnection with all that is and knowing that you're not better or worse than anyone else. We’re all created in the equal image of the Divine, the equal image of God, and we’re all equally loved. When you shift out of the ego, out of those past fears and doubts and judgments and into greater love, it's so much easier to see the oneness in everyone and everything, to step into your role as a way shower of the new energy, returning to love in the present, asking your angels to help guide you forward, and living in alignment with the authentic truth that you are. This month is great for getting clear about what you really want, about what at your soul level is drawing you into the future. What excites you? What enlightens you? If you're not sure, what are you curious about? Move in that direction. The September equinox is coming up very soon now which means the start of spring in the southern hemisphere and fall in the northern hemisphere. Whatever part of the world you’re in, it’s a good chance to clear out the old. What possessions do you never use? What clothes in your closet do you never wear? What things do you have to justify in your mind holding onto? In letting go of things like physical possessions or letting go of certain habits that you know aren’t serving you or letting go of worries and doubts and letting go of past pain and past fears of your inner child, you pave the pathway for new energy, for new opportunities, for more of that authentic soul light at your core to shine through. And when you embody this light and soul power, it becomes so much easier to start taking steps in the direction of your dreams, to make your dreams a reality, to step into your highest calling as a light worker. This month is about shifting energetically so that you start doing your light work, standing in love, loving yourself, taking care of yourself and loving other people. Remember to ask your angels for help, because they're here, they’re with us and they're more than willing and able to help us overcome challenges, and any sticky points and challenging aspects that may appear this month. Because whenever there’s a challenge, on the other side of that awaits huge opportunity and breakthrough. So, if you feel challenged, get excited. A challenge means you’re growing and it means on the other side of that challenge, doors are opening and opportunities will appear. Ask the angels to help guide you through your challenges, to stay positive, to return to love and to embody your light. Know that by working hand-in-hand with the angels (by simply asking for help), you can co-create incredible change in your life that then has a vast ripple effect through all that is. Thank you so much for joining me for this September angel card reading. Be sure to subscribe to my YouTube channel, so that you’re updated when new angel card readings, teachings and angel messages are posted. More goodness is coming soon in terms of the content available on this site and in terms of the incredible light and opportunity aligning in your life. Have a beautiful month… I’ll see you soon! P.S. 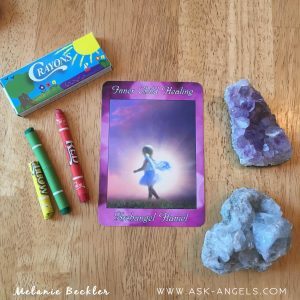 Draw a card yourself from the Ask Angels Oracle Cards here! You’d need an Army to drag me back, and it still wouldn’t work. They’d never get past Archangel Michael!!!! Thanks Melanie, last month I was working on healing my inner child but as usual I forgot or it got a little hard and so left it. Seeing this message reminds me that I have to focus on her again, nowever it is hard, there is a lot to heal and so I should ask the angels..however it just seems to hard. Thank you so much ive been following you since you started. You are a angel to me! Thank you again. Thank You and thanks the Angels for your Help here!! 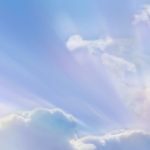 Hi Melanie – I read the Angel card this morning and it was PERFECT timing! Just last night I came into a situation that brought back unpleasant memories of a past relationship. I actually did start cleaning out my closet and it felt good so I plan on doing more tonight. I went to bed asking for help because I’m unsure how to deal with the current financial situation having to deal with travel in September. I need to relax and remember to ask for help. Thank you for what you do!! Thank you Melanie for this guidance and wonderful light work! !God bless you!!! Melanie, thank you for filming these readings and thank you for explaining the two card reading. Your message resonated with what is going on in my life right now. Today was a rough day for me and I know I’m at a crossroads; your reading provided some light for my situation. Thank you Melanie! This was Awesome!!! Thank You So Much Dear Meleiane. 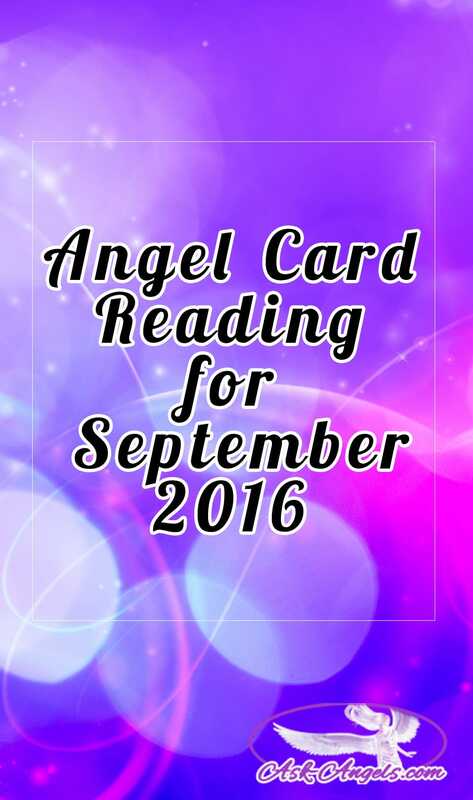 I really love this september angelic card reading. I ask for my angels help every day. I pray every night for help. What do I get? Everything that is bad or unjust happens to me. They are not there for me and I give up. Oh my Melanie! The angel reading was so BEAUTIFUL & I was crying throughout the entire video. Healing tears of course. The 2 cards and all of your words & listening between your words as you had suggested resonated within me. It was just what I needed to hear and so spot on. Thank you, thank you, thank you for your compassion, love, dedication, sharing your lightworking gift with us and for just being the beautiful human being that you are. You are truly a blessing for me. I think about you everyday & I listen to 1 of my many meditations that you have chanelled at least 10 times a week. Much love, light & blessings to you & yours. Happy today Melanie, Listening to your video helps me re-think of actions I have to take. Cleaning is one of the words in my life right now in every aspects of my life. Thank you and be well.